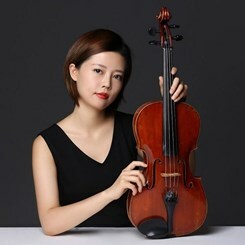 Violist Sinan Wang, was born in Dalian, China, and she will begin her DMA studies at the University of Maryland this Fall, studying with Katherine Murdock.Sinan began viola studies at the age of 10 with XiaomingMa. Upon graduating from the school associated with Shenyang Conservatory of Music, she continued her studies at East China Normal University with DapengSun, where she received her Bachelor’s Degree. Sinan came to the US on a full scholarship to receive her Artist Diploma from Texas Christian University where she studied with Professor Misha Galaganov. She received her Master’s Degree from Rice University at the Shepherd School of Music, studying in the studio of James Dunham. Sinan has participated in numerous music festivals, including Aspen Music Festival, Conservatory Music in the Mountains, Klagenfurt Music Festival, and Viva La Viola Music Festival; and was winner of the Ernst International Viola Contest in Klagenfurt, Austria in 2009. She has been accepted to be a member of The Orchestra Now at Bard College, and has served as a substitute player with the New World Symphony. Request Lessons with Sinan Wang today!